After graduating from London Studio Centre, Emma Cannon went straight into the professional production of the musical Grease. 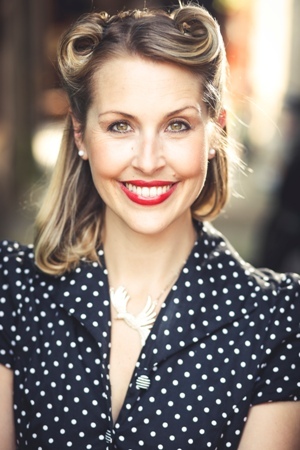 Since then she has worked extensively in musical theatre throughout the UK, Europe and in Londonʼs West End. Shows include Disneyʼs Beauty & the Beast, Eurobeat, Follies, Vampirette and Annie to name a few. She has played the lead role in many pantomimes for Qdos Productions including Jack & the Beanstalk, Aladdin and Robin Hood performing in some of the most beautiful theatres in the country. Emma has recently recorded the vocals for a series of childrenʼs song books, including Christmas Carols, Sing-Along-Songs and Bedtime Lullaby all published by Priddy Books. Emma spent six months travelling the Caribbean and South America as principal singer on board Oriana for P&O Cruises and it was here that she met her future husband, one of the house musicians! Emma loves Motown music, and Katie still finds it amusing that one of her all time favourites is called “The Onion Song” She is still working on getting it in The Nightingales repertoire!